I have read every one of Victoria Scott’s published books and I think that Salt & Stone might be one of my favorites. I loved Fire & Flood because there were so many unique things about it, especially the main character Tella. I love Salt & Stone because of the way the plot unfolds. The thing that is so amazingly awesome about Salt & Stone is there is always something going on. I would put the book down and then pick it back up and be right into the next crazy thing. I loved it. So addicting. Although after I finished reading it I wanted to stare at the wall for a while. Digest what I read and then I desperately wanted to talk about it but I don’t want to ruin it for anyone else. The best thing to do with this book is go in blind. It is action packed like I said but there are also some seriously emotional moments. Like oh my god that just happened, even though you know that it could happen. Anything can happen really. I was having mixed feelings about Tella in this book. I understood her frustration with the way Guy is overly protective of her but she’s a strong girl. I felt like her need for approval was actually making her weak. I kept thinking she needed to pull a page from Harper’s book. Knowing she’s fierce and not needing anyone to tell her so. As we progress through the third and fourth portions of the race she really starts to develop and by the end I really liked her again. She learned along the way and managed to find balance. I love the group that Tella travels with. It’s an interesting dynamic and you find yourself getting attached to the characters. They come and go for different reasons. It is a race to save a loved one. That ending. Geez. Once again I want to talk about so much of it!! Ahhh! 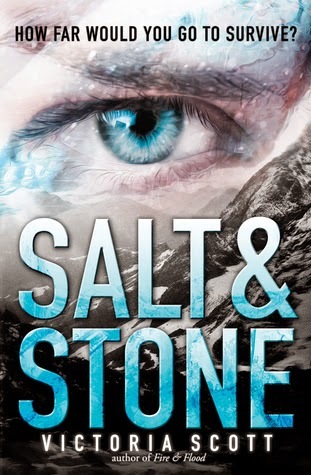 If you enjoyed Fire & Flood, I think you will be blown away by Salt & Stone. I’m still wrapping my head around it.